The motorcycle cruise control Go Cruise 2 is a universal throttle control that lets you take your hand off the accelerator and maintain your speed. It lets you rest your arm, shoulder and back muscles while keeping the throttle where you want it. You'll find it particularly useful on long stretches of the Interstate Highway System where you don't have to work the throttle too much due to traffic or terrain. Just set this mechanical cruise control and you can maintain a constant speed. Even on short, level highway stretches it lets you relax. This is especially useful to me because it helps me to avoid sore shoulder and back muscles when I'm on the road for a multi-day ride through all sorts of terrain. It lets me maintain my speed while I take my hand off the throttle to stretch and exercise tense muscles. If you have more than one motorcycle, you can easily move the Go Cruise 2 to any of your rides. This universal throttle lock gives you a simple mechanical solution to installing a cruise control. 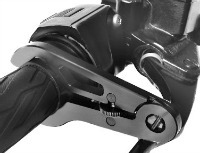 You secure this sturdy aluminum-alloy lock to the throttle grip with the unit's adjustable tension gear. You can install it in just a few seconds. When you reach a desired cruising speed, just press the cruise control down with your index finger until it rests against the brake lever. It will hold the throttle's hand grip at the point where you've twisted it open. And while the tension gear on the cruise control provides enough pressure to hold the throttle in position, you can still roll it off with ease to reduce your speed. I must admit I don't get too many opportunities to ride on wide-open highways that are relatively free of traffic. So, I don't use my cruise control too often on big roads. However, because I seem to be getting sore muscles more often these days after I ride for just five or six hours on twisty roads, the cruise control enables me to relax and stretch occasionally and avoid muscle discomfort. As a result, I can continue riding for 10 or 12 hours -- or longer. This cruise control is nicely made of sturdy aluminum.